I’ve said it over and over, it’s easy to make beautiful food when you start with good ingredients. This is one if those belly warming, cold morning, gets you ready for anything coming you way kind of breakfast. It’s like the oatmeal cookies cousin that came from a yoga retreat with knowledge of health and wellness. I’d almost call it an oatmeal cake, but I wouldn’t want you to think anything unhealthy here because this tasty Baked Cranberry Oatmeal is all healthy and wonderful. And I’m serious about the cookie cousin too, Brian tasted it and said it reminded him of an oatmeal cookie, good call babe! It totally does in terms of the golden brown sort of crunchy topping that happens while it bakes. Plus all of the oats flavor friends that came to this bakes party. There’s maple syrup and mashed bananas for natural sweetness, and the banana helps with giving it a tender crumb. Then there’s milk, spices, and of course a touch of melted butter. Which all means this tastes oh so good. It’s not a regular bowl of oatmeal, which I’m cool with, but I wanted something a touch more special. After all it is the holiday season and there will be hungry guests that need feeding, this is the perfect dish for them. It takes a few minutes to put together and get into the oven to bake. It almost smells like cranberry banana bread while baking, which tis the season smells amazing. So totally bake this glorious healthy Baked Cranberry Oatmeal for your family and loved ones. You’ll feel good that you’re starting the day off on a better healthy note during these indulgent holiday times. It’s all about balance friends! I’m very happy to be partnering with Graceland Fruits to bring you the best quality dried fruits on the market. They’ve been in the fruit drying business since 1973! They work with closely with their farmers and only use the best fruits for drying. Their knowledge helps keep the fruit as natural and wholesome as possible so we can enjoy them at home! See above and below, those are glorious whole dried cranberries, Mother Natures dried candy. Graceland knows how to do it best. There are no additives, artificial sweeteners or ingredients in their fruits. They are Non-GMO, and soon to offer Organic, all good things. 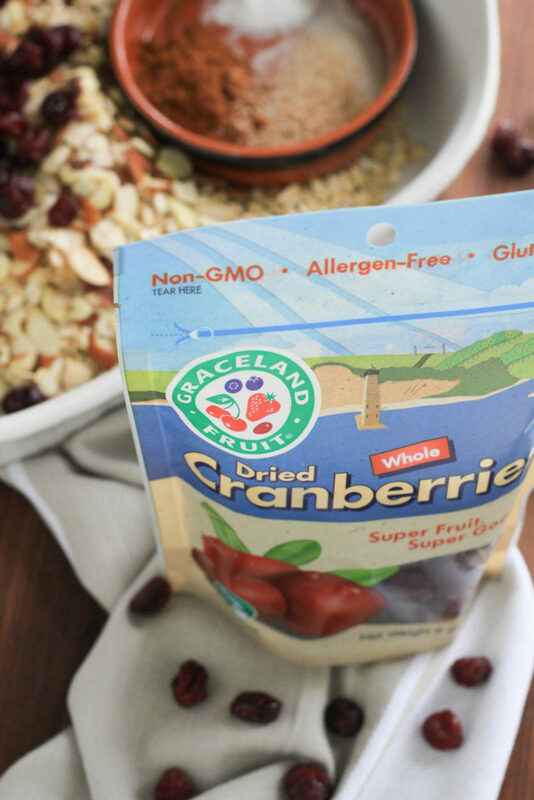 You can also use other Graceland dried fruits too, not just cranberries, like their super food yummy dried blueberries! 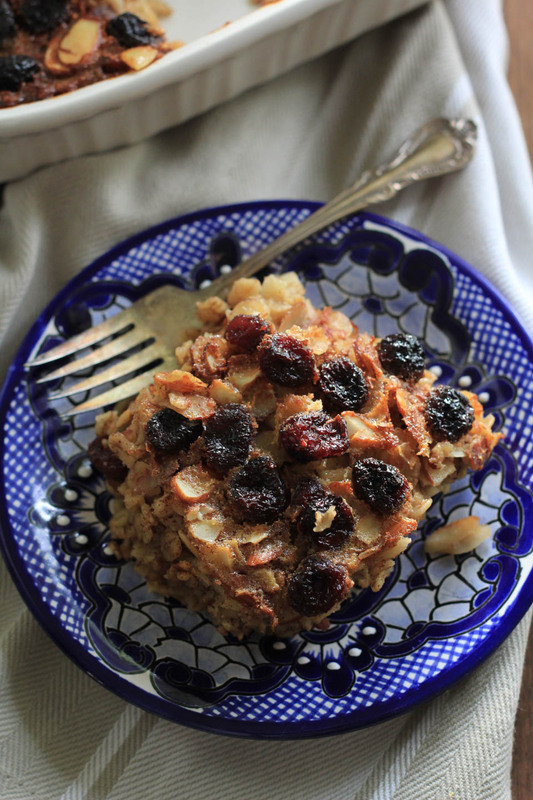 This can be made all year long for a wholesome breakfast that can feed you all week long. Place oven rack in center of oven and preheat to 375 degrees. Butter a 8×11 oven safe dish. 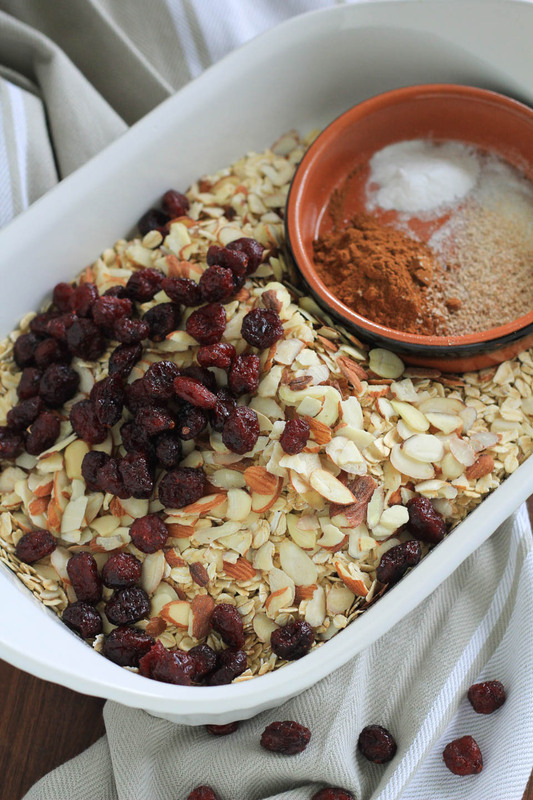 Combine oats, 1 cup dried cranberries, 1/2 cup almonds, cinnamon, baking soda, salt, and nutmeg in a large bowl, mix well. Combine milk, maple syrup, melted butter, egg, mashed banana, and vanilla extract in a medium bowl or large easy to liquid measuring glass, use a large fork mix to combine well. Add oats mixture to prepared pan. Very slowly and evenly pour milk mixture over oats, allowing mixture to soak in as you pour. Sprinkle 1/2 cup almonds followed by 1 cup of dried cranberries over top. Place pan in oven and bake for 40-45 minutes, or until golden brown. Remove and serve immediately with drizzled maple syrup. Store leftovers in the fridge in an airtight container for 3-4 days. Optional added toppings: Greek yogurt, creme fraiche, or a dollop of mascarpone. Disclosure: This is a compensated post in collaboration with The Fruit People at Graceland Fruits. As usual all opinions are my own. Thank you so much for supporting the brands that support NJB! 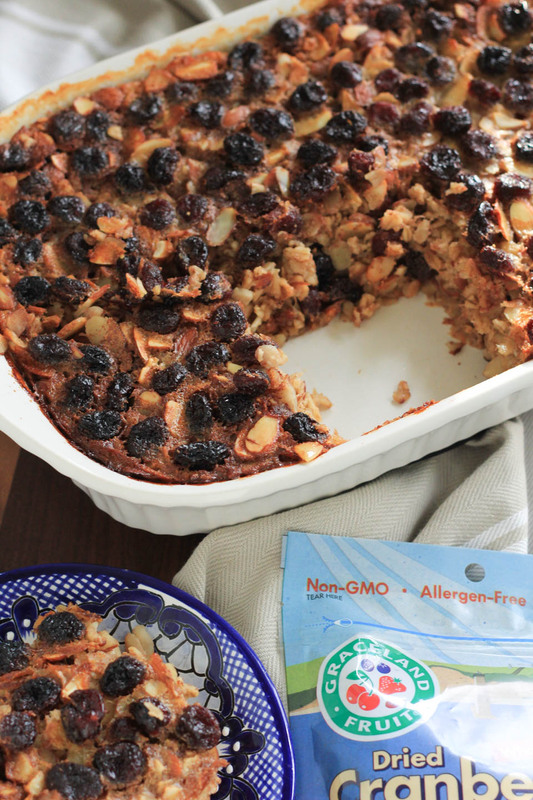 Baked Cranberry Oatmeal is exactly what I should have had for breakfast this morning! I love cranberries any way you give them to me! I lovvvvve this! 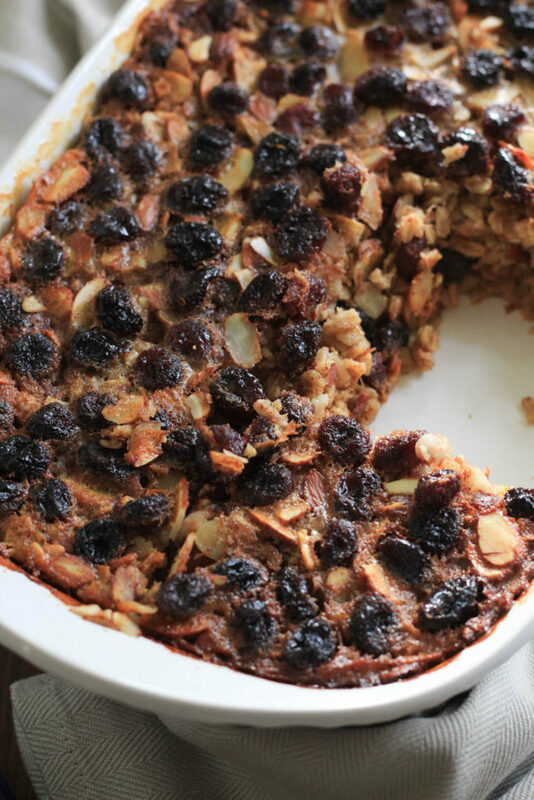 Baked oatmeal is the best, I love making a batch at the weekend and then eating it over the following few days. This one looks so perfect for the holidays! Me too, I can’t wait to make another one for Christmas! Oooh, this looks like the perfect breakfast on a cold winter day! For sure! I hope you like it :). This is a perfect winter break breakfast treat! Hahaha, that’s awesome! Thank you, Gerry! Yay! Thank you, me too :). 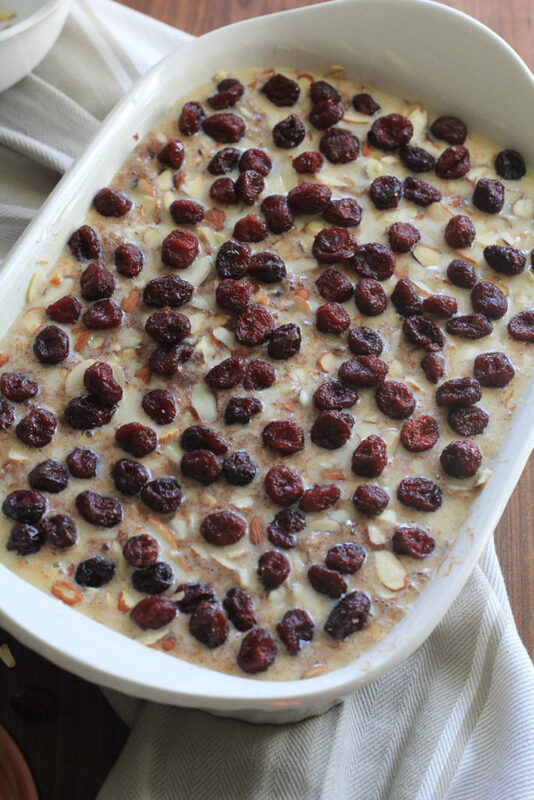 This baked cranberry oatmeal looks so warm and comforting! What a delicious way to start the day! Will be perfect for breakfast on Christmas morning! Thank you so much, Taylor. It really is, it’s filling, not too sweet, and so good!